These are the notes and slides for my talk at Internet World Kongress & Fachmesse, given today in Munich. I believe a livestream of the talk is available on the website and there may also be an archive with slides. This talk is about how business is being disrupted by the web and the things we can do to adapt successfully, both at the organisational and personal level. It combines some of the elements from two talks I gave earlier in the year: the web Super Skills I discussed at TEDx Brighton and the ideas about disruption, change management and Glasnost moments I talked about at CityCamp Brighton. We’re having some fun here, but just a bit. So obviously, I am talking to a room of digital marketers, so the idea of being at the leading edge is attractive, so is the idea that they have the stuff that is required to be the leaders of their wider organsiations. The point is that they are closest in some ways to the web’s disruption of business. They have the tools and the need to adapt fastest, so the insights they gain may be what business as whole needs. The context is that we are living and will be living in a time of constant change, of permanent revolution. Marc Andreesen explain this particularly well – as I’ve mentioned before. The web is pure software, we can keep reinventing it. Buzzwords are the hamster wheel of digital media and thinking clearly. We spend a lot of energy getting nowhere. Two or three years ago, after a talks about Twitter people were asking what’s the next big thing after Twitter? Better to udnerstand the big trends and call them what they are. I think about the social web, the data deluge and the everywhere web as the big meta trends. We need to level up our thinking to deal with complexity. A friend of mine studying creativity at Goldsmiths introduced me to “threshold concepts”. they are ideas you really have to grasp before you can understand a whole lot of other things. 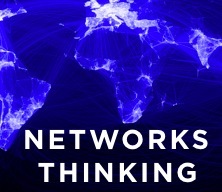 Networks are one of these, perhaps the most important for our age. We think we understand networks, but we really don’t a lot of the time. When you are a German learning English you realise there are “false friends”, (“falsche Freunde“) words which sound or look the same in both languages but mean different things, e.g. “Gift” in German means “poison” rather than a present. We don’t grasp how magnificently, terrifyingly complex networks are. We like to draw pictures of them and then think we’ve captured their meaning, when they are more like the weather – always changing, hyper-complex. Predictable if you are smart and have a huge amount of data and training, but only to a point and only some of the time. (There’s mileage in that weather forecasting analogy – I’d like to come up with it. One of the traps we fall into when we are thinking about networks is “platform-ism”. We see Facebook as a proxy for the web, as a our new TV channel, we see Likes or Fans or Followers on Twitter as the gauge of our success without taking the time to understand our networks. Another mistake we make is to think that influence is something fairly straightforward in networks. To be sure there is a celebrity effect – when someone with a huge amount of followers on Twitter plugs a charity or website it gets a lot of traffic (sometimes). But influence is not as predictable or as straightforward as we think. We fall prey to what psychologists call “narrative bias” – we think we see how things work, think it is obvious after the facts. Duncan Watts’s new book will deal with this subject in some detail. Talking about networks with some mathematicians last week one remarked that place, location in a network might be the thing that best predicts influence, rather than popularity. Howard Rheingold talking about digital literacies. The visual for the social web slide is an inforgraphic by iCrossing UK – read more about it on the Connected blog. John Hagel in interview with O’Reilly Media. His book The Power of Pull expands on things like serendipity and the speeding up of edge-to-core. Gartner’s hype cycles. If you haven’t come across them before they are fascinating and the model is a useful one even if it is being subverted by the web on occasion. An account of Glasnost, Perestroika and the fall of the USSR which I found useful from Prospect magazine. Connected by Christakis and Fowler is about the best (and most accessible) book on human social networks I’ve read. “Havana complex” was an idea recounted in Eric Beinhocker’s The Origin of Wealth, a book on complexity, evolution and economics. If you saw the talk at Internet World Kongress or on the livestream and have any questions or feedback please do let me know.